Thanks for all of your kind good wishes. My mom hasn't had a chance to read them yet, but she will be so delighted when she does. She is still in the hospital and hasn't responded quite as quickly to the antibiotics as we had all hoped. She was supposed to be released Saturday afternoon, but her fever returned. We are hoping she'll be able to come home today. Roger and I had an uneventful journey down I-5. Red-tailed hawks on fence posts and power poles, a giant osprey nest along Pyramid Lake, cattle yards and feed lots. The central valley requires imagination to find its inherent beauty. I lacked that imagination on the way down. Lots of other cars barreling down the highway at 90 mph. We were the slowpokes at 75 mph. Update: My sister and I brought our mom home Sunday at noon. She's in great spirits and hopefully on the mend. Thanks again to everyone for your good wishes. It really helps. One thing I learned watching my sister in the hospital is how important it is to have a good advocate. She asked questions, wouldn't let anyone give medication without a complete and detailed explanation, and conveyed information to nurses after staff shift changes. I'm sure you wouldn't be surprised to know that hospitals are rather quick to prescribe things that have bizarre side-effects. If you ever wind up in the hospital, bring an advocate. 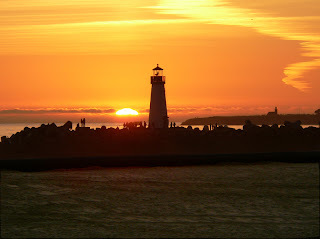 Here the sun is sinking into the Pacific. At day's end, at land's edge we wonder where on earth there is peace? Has there ever been peace? Has the sun ever set on a day when no blood was shed in war or rage? Would we know ourselves in such a world? We may be away from these internets for a while. My mother was just diagnosed with bacterial pneumonia. One of the reasons we came back to California is because our mothers are in their 80s, and both need our loving attention. We were supposed to see my mom for Thanksgiving, but Roger was ill and had to have emergency surgery on Thanksgiving Eve. This month my mom was supposed to come up to observe my father's birthday with us and scatter rose petals in the bay, but she had to cancel because she wasn't feeling well. Now, a week later, we know that she is really quite ill and had to be admitted to the hospital on Thursday. We came to California to help, and so help her we must. She actually does have a speedy wi-fi connection at her place (truly the fastest connection we've ever seen) so we won't be completely disconnected, but we may be completely pre-occupied. Please keep my mother in your thoughts, friends. She reads the blog everyday. She loves you guys. 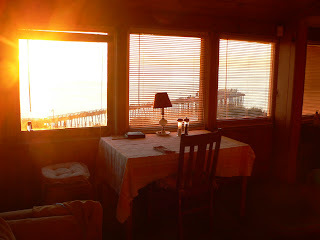 this is our dining table, and the capitola wharf beyond. 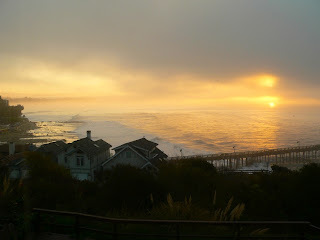 i'm awash in memories here in capitola, from several eras of my life. this is the house in which i spent many summers when i was young. right out there is the beach where i played in the waves and the wharf from which i caught untold numbers of perch. i lived here briefly in 1970 with my first-born daughter when she was a baby. i remodeled a big chunk of the house in 1985. robin and i lived upstairs from 1989 to 1994. i rebuilt the garage in 1991.
it's fun and interesting to be here where we found each other. we're in the same two upstairs rooms we lived in for 5 years, about 370 square feet. through a BIG earthquake. we take the same walks we did back then. shop at the same stores. 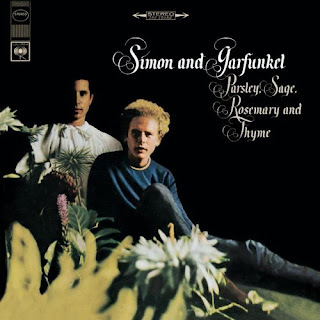 listen to the breaking waves at night lulling us asleep, as we did back then. we dined in the same restaurant, at the same table, where we dined on one of our first real dates, where we first professed our love for each other. of course, the restaurant has changed quite a bit in 18 years, but the food and service are still excellent, as is our love. we drove up the coast to san francisco last weekend to see my youngest daughter and her boyfriend. i've spent time on almost every beach on that stretch of coastline. half moon bay is, well was back then, a 20 minute drive from where i lived in san mateo during high school. 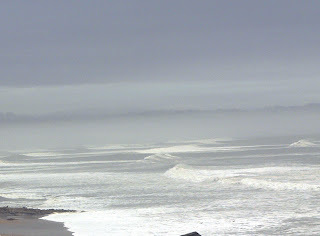 i spent many afternoons surf fishing and many nights drinking beer on those beaches. robin has written about our tradition of remembering her father by throwing roses, this year rose petals, from the wharf where her family consigned his ashes to the sea. i always dedicate one rose, or petal, to my own father. his ashes, some anyway, were put into the ocean on his favorite island of maui. i figure it's all one ocean. this year as we were out there with our rose petals from port townsend i looked back down along the wharf and saw a collage of my own history. from a 6 year old me buying squid for bait and fishing thru the cracks in the planks to the stormy night robin and her sister, brothers, and mother scattered the ashes onto the water from the landing float which was pitching up and down at least 5 feet in the heavy surf. 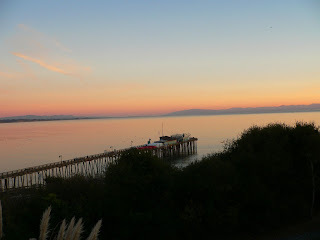 the wharf has gone through many phases in my lifetime, as has the village of capitola. when i was young the wharf was a place for fishermen (fisherpeople?) and capitola was a slightly seedy vacation town. both the wharf and the village got seedier and more ragged around the edges in the late fifties and early sixties. now the wharf is a tourist attraction with mooring buoys where sailboats tie up in the summer and a wanna be chi chi restaurant. the village and surrounding bluffs are filling up with large, high-end mcmansions. the skiball and penny arcades of my youth are now tony restaurants and curio shops. below is a picture of the house from outside on the same morning as the picture above, which looks out from the upstairs windows. Today would have been my father's 89th birthday. Unfortunately his years stopped counting forward when he died at the age of 73 in 1992. For years after my family had gathered to scatter his ashes into the sea from this very wharf, Roger and I walked down these old planks to toss roses into the bay for him. We did that on his birthday and the anniversary of his death. It was a spontaneous ritual, one that sprang out of having no grave to lay down our flowers or our tears. Being back in California on my father's birthday gives us this special heart-tugging opportunity to walk down the wharf for him again. This time we are not going to toss fresh roses in the bay. 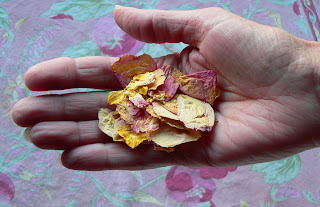 Instead, I saved these rose petals from our yard in Washington. We'll go down to the wharf after sunset Wednesday, and send our love and rose petals down into those stormy waters, saying out loud to a man who's been gone a long time that he is still dearly loved, missed, and remembered. Do Sea Otters Have Bellybuttons? I wish we had more than this question, but we're tired and it's been a long day. We drove 75 miles up the coast to San Francisco on Sunday, had lunch with Elena (Roger's youngest) and her partner Jimmy. We walked through Golden Gate Park and the panhandle. Saw people that were like flashbacks to an earlier era, pierced and tattooed, painted and preened. We drove home with the sun setting on the edge of a magnificent continent. We remembered why love this part of the world. But the question remains, do sea otters have bellybuttons? 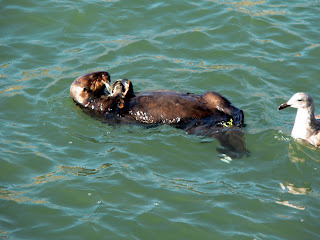 I photographed this sea otter on Saturday and had an opportunity to be fairly close to it. When I looked at this photograph, I thought I saw something that looked very bellybutton-like (click on the pic and take a look). What do you think? 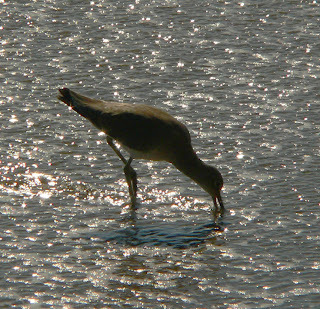 What we've been really intrigued by, though, is the presence of a gull hanging out very close to the otters. They seem to be waiting around for some inadvertently dropped food, or maybe they clean up whatever morsels have been left behind. We just don't know, and it's only been the past few days that we've noticed this interaction. I guess today we have more questions than answers. But even before that, we had both read an article in the Seattle Post Intelligencer about a Washington Congressman, Jim McDermott, who the paper identified as one of nine US representatives who had voted against Christmas. What? 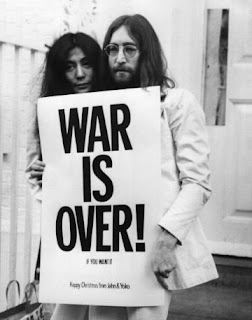 We have no global climate policy, no single payer health care, no updated CAFE standards, no Constitutional accountability, no compliance with the Geneva Convention against torture, no open government, no caps on spending for the war, but we do have a new resolution recognizing Christmas and the Christian faith. I guess this must be our contribution to that little piece of hypocrisy. All sounds were borrowed without permission from the internets. I googled free mp3 download of Silent Night, and this version came up. The rest of the audio was found on Free Speech Radio, National Public Radio, and CNN. We thank them for seeing this as a fair-use creative endeavor meant only to educate, entertain, and enlighten. We're still here. We're watching the world outside our windows. We're reading the news everyday. We're walking along the shore, but it's the wind that brings tears to our eyes. We watched Judgment at Nuremberg last week. We're expecting Inherit the Wind on Tuesday. We're living life in the here and now. We're lamenting the past and fearful about the future. We're seeing dolphins through the open door while we do the dishes. We are learning how to breathe in time with the sea. The first link above takes you to You Tube and you can watch the scene where the Nuremberg verdict is read. Tell us it's not relevant to the times in which we live. 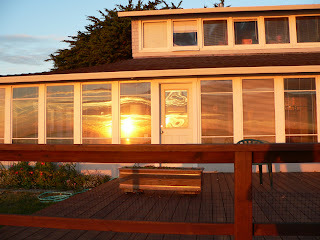 I have been out shooting panoramic photographs of the sky and bay from the deck. It's hard not to keep trying to capture the entire breathtaking scope of it, so I keep at it. The light and shadow, color and hues change all day long. It's just insufficient to say it was a cloudy day. The grays and blues have a palette that is impossible to describe and even harder to match without seriously abrupt transitions. These are five photos taken a mere one or two seconds apart. This view is looking at the light in the sky from east to west. On Tuesday a stormy sky stirred up the bay with waves that thundered and crashed for hours. There was no way to even get a good single shot let alone three or five to convey the sound and fury of that much water moving. An older, experienced surfer took his board out for a last ride in those waves on Tuesday. There were 20 foot swells. He lost the tether to his board and couldn't successfully swim this pounding surf back to shore. On Wednesday the sun rose through a half-shadowy sky, and the waves still roared. our garden here in sunny (so far) capitola. that's a mix of various lettuces planted about 4 weeks ago. i've been trying to compose a grand epic narrative of my recent health challenge. feh, as they say on the internet. or is it meh? other people we know have much worse health problems than i had, and still others have no insurance for even minor problems. i am well now. i got excellent care at santa cruz medical clinic and sutter hospital. robin and i marveled at the poise and equanimity of the the receptionists, nurses, physician's assistants, and doctors who deal with people in my condition or worse all day, or shift, long. waiting rooms full of pain and infection. i did pass out from pain (a story for another post) and i did have an abscess that would have been much more serious if untreated, but i got proper diagnosis, including a ct scan, and treatment, on short notice. i took heavy duty antibiotics, cipro and flagyl, for 10 days. my malady was, in the scale of maladies, a simple infection, even if in a secluded place--the wall of my lower colon. this care was paid for (mostly, we haven't gotten bills yet) by medicare and some sort of supplemental from robin's retirement insurance package. we did not have to hesitate to consider money. too many others are not so fortunate. robin reminds me that i remarked, somewhere in the middle of a painful day, that i felt guilty that i was so well taken care of while i knew that so many were not. somewhere in the past i read of the notion that the strength of a nation, especially a democracy, depended on a healthy and well-educated populace. there was probably mention of fiscal responsibility too. am i un-american to notice and point out that our country isn't doing very well in all three of those areas? 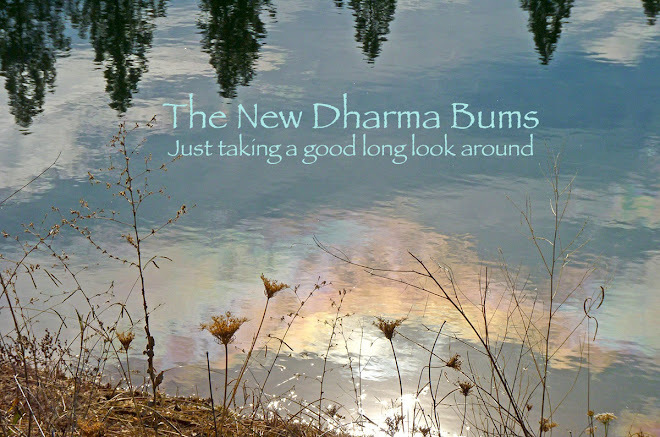 We are not really the Dharma Bums. That was Japhy Ryder and Ray Smith from the imaginative ramblings and rants of Jack Kerouac. So we think it may be time to rename this blog, but we don't know what to call it. I think the problem lies in the fact that the blog has no direction or purpose. We are not naturalists, nor are we poets. We are not political writers, nor are we biologists. We have no claim to anything other than our insatiable appetite for knowledge. Roger is a damned good carpenter and cook. I can take a pretty good picture every now and then. We are masters of none. Do we need a new name? What do you think? Suggestions?